Review written by and copyright: Eric Cotenas (6th February 2019). The Institute of Cybernetics and Future Sciences has developed the Simulacron, an artificial environment of ten-thousand identity units ("the world in a nutshell") on which to run simulations for forecasts of the real world effects of various changes. Director Herbert Siskins (The Lost Honor of Katharina Blum's Karl Heinz Vosgerau) is embarrassed in the audience of Secretary of State Von Weinlaub (Heinz Meier) when Simulacron's creator Professor Henry Vollmer (Mark of the Devil's Adrian Hoven) – whose nerves have been severely frayed by a series of debilitating headaches – makes a scene at what was meant to be the computer's unveiling before dying in a mysterious accident. Vollmer's colleague Dr. Frank Stiller (Firefox's Klaus Löwitsch) is immediately promoted to Technical Director by Siskins in hopes of getting the project back on track, but he is unnerved when Security Director Günther Lause (Enigma Rosso's Ivan Desny) vanishes into thin air before he can pass on something that Vollmer discovered about Simulacron that he believed could mean the end of the world. Stiller at first suspects some kind of industrial intrigue with his trusted secretary Maja (Possession's Margit Carstensen) taking ill and being replaced by Siskins' mistress Gloria (Berlin Alexanderplatz's Barbara Valentin), reporter Rupp (The Boogeyman's Ulli Lommel) asking questions about the friendship between Siskins and United Steel president Hartmann (Victoria in Dover's Rudolf Lenz) and whether the company is being given access to the simulator, as well as Siskins bringing on slimy Michael Holm (Why Does Herr R. Run Amok? 's Kurt Raab) as his assistant and sidelining trusted Fritz (Das Boot's Günter Lamprecht); however, the seeming erasure of Lause not only from the employee database but everyone else's consciousness in place of long time Security Chief Hans Edelkern (The Winds of War's Joachim Hansen) and claims made by Einstein (GoldenEye's Gottfried John) – the control identity in the artificial world who has inexplicably managed to transport his consciousness to the real world in another body – cause Stiller to question the very nature of reality as he knows it. As Stiller suffers from similar headaches to that of Vollmer and describes clues that vanish before he understands their significance, project psychologist Franz Hahn (Effi Briest's Wolfgang Schenck) doubts his sanity, and Stiller starts to wonder if he can even trust that Vollmer's daughter Eva (Mascha Rabben), with whom he is falling in love, is who she claims to be when he is set up for her father's murder and on the run from the police and the men with the nets. Based on the novel "Simulacron-3" by Daniel F. Galouye – later adapted as The Thirteenth Floor in the late nineties when virtual reality was still a fantastic concept – World on a Wire is science fiction as only director Rainer Werner Fassbinder could envision in the pre-Star Wars/Blade Runner sci-fi cinema of ideas. Eschewing visual effects and futuristic props, the world of the film is a contemporary Germany – Von Weinlaub mentions the initiative of "Perspective 2000" and the importance of the project in forecasting the resource needs in the eighties and nineties – that is simultaneously alien, populated by fewer people and more modern architecture (including Parisian developments under construction and underground shopping malls that were still a novelty to Germans) in which the vintage costumes and decadent depictions of the leisure class of the past familiar from Fassbinder's earlier mise-en-scene pass for that of the same in this alternate vision of the then-present. The genre still one of ideas over flashy action at the time, the film is philosophically stimulating in its questions about our perceptions of reality and construction of identity as well as thrilling as it moves back and forth between the possibilities of the virtual world impinging on the real world, whether the real world itself is another simulation, or if Stiller is being gaslighted and the whole thing is a giant smokescreen in order for business and political interests to gain control of, and profit from, a program intended for the good of humanity. Lemmy Caution himself Eddie Constantine (Alphaville) makes a cameo appearance. The miniseries would make an ideal double feature with Wolf Gremm's Kamikaze 89 which would mark Fassbinder's own final acting role and his penultimate film project. 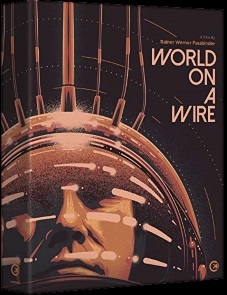 Restored for the 60th Berlin Film Festival in 2010, World on a Wire was immediately released to DVD in Germany by Arthaus and the UK by Second Sight while it had its Blu-ray debut in France from Carlotta Films. Criterion followed in 2012 with their Blu-ray and Studio Canal in Germany the following year. All of these editions utilized the same master but had their relative drawbacks. Criterion and Studio Canal slowed the film down to 24fps from the original 25fps television framerate while the Carlotta edition was 1080i50 but not English-friendly. Second Sight's 1080i50 MPEG-4 AVC 1.33:1 pillarboxed fullscreen Blu-ray retains the original framerate and also afford more bitrate to the presentations by splitting the two parts between two discs whereas the other editions placed both parts on a single disc with extras. The 16mm photography retains its grainy look, particularly with low lit scenes and highly saturated gel lighting, while making more apparent Fassbinder's aesthetic with the protagonist's loss of consciousness illustrated both by shifting out of focus and the obvious sliding of a Vaseline-smeared glass filter in front of the lens. Detail in faces and clothing is sometimes lost in some long shots but that has more to do with the 16mm filming and lighting than the restoration. The restoration credits appended to the original end credits include a Dolby Digital logo which may mean that a 5.1 remix might have also been prepared like the restoration of Heimat or perhaps the mono track on the DCP was just encoded so as to prevent any phase issues in the music and effects from straying into surrounds. What we get on the disc is an uncompressed German LPCM 1.0 mono track that has some surface noise apparent in silences while the dialogue remains clear – the mix is such that all voices are mixed at the same level regardless of the placement of the actors in the frame so it can be easy to confuse who is speaking in long shots when characters have their faces averted from the camera – and music is deployed as sound effects apart from some song selections. Optional English subtitles are free of errors. Extras on the first disc start with Juliane Lorenz's documentary "Fassbinder’s World on a Wire: Looking Ahead to Today" (48:31) which intercuts documentation of the film's digital restoration with cinematographer Michael Ballhaus (The Age of Innocence) sitting in, with separate interviews with surviving cast and crew including screenwriter Fritz Müller-Scherz (The American Friend), actor Vosgerau, and Berlin Alexanderplatz producer Günter Rohrbach. In "Observing Fassbinder" (7:45), still photographer Peter Gauhe recalls being snuck onto the set of Fassbinder's The Merchant of Four Seasons by cinematographer Dietrich Lohmann (Deep Impact) and then working as a still photographer, grip, gaffer, camera operator, and actor on various Fassbinder productions, acquiring his professional training through experience. Also on disc one is an On-set Featurette (4:18) in which Fassbinder discusses his taking on the science fiction genre and his means of visualizing it. Disc two includes "No Strings Attached" (29:15), an interview with assistant director Renate Leiffer (Satan's Brew) who went to Paris to study to become a translator, worked on the production of Is Paris Burning? and returning to Germany where she worked on other films as a script supervisor before meeting Fassbinder. She discusses her various roles in Fassbinder's films from 1969 to 1980 and seeing how he progressed as a filmmaker through practice and working with industry professionals – noting the influence of editor Marie Anne Gerhardt (Eight Hours Don't Make a Day: A Family Series) on Fassbinder's cutting and shooting for the edits – and contexualizing World on a Wire in the aftermath of his fallout with theatre director Peter Zadek for whom his troupe of actors working simultaneously working on stage while filming Lommel's and Raab's Tenderness of the Wolves. Of the series, she notes that Fassbinder was not a stickler for the details of the sets, trusting Raab for his design choices, complements Löwitsch's performance as his best, and also reveals that Rabben mumbled so much of her performance that Fassbinder had it dubbed by Ingrid Caven (Beware of the Holy Whore) who had a small role as a secretary. Also included is "The Simulation Argument" (22:31) in which Oxford professor Nick Bostrom explains his theory about post-human intelligences running simulations of human ancestry, and the series' second part original broadcast recap (4:23). Not provided for review was the 50-page perfect-bound booklet featuring new essays by Anton Bitel and Daniel Bird and archival writing by Daniel Oberhaus and Christian Braad Thomsen. World on a Wire is science fiction as only director Rainer Werner Fassbinder could envision in the pre-Star Wars/Blade Runner sci-fi cinema of ideas.